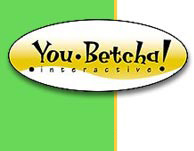 You-Betcha Interactive, llc. designs, develops and distributes interactive games and entertainment that inspires creativity both on and off the computer. Game Inventor of the Year! Mary Jo Reutter, principal of You-Betcha Interactive, was the proud recipient of the TAGIE award for Excellence in Game Design at the November 2010 awards ceremony. the Game Inventor of the Year award from Peggy Brown, the 2009 recipient. We're very excited about our latest product —The Home Gene-Splicing Kit for the iPhone. It offers kids of all ages a chance to create fun, hilarious creatures—and the gene-splicing machine makes it so easy! Need a genetic makeover? Or just a good laugh? Give it a try! The Home Gene-Splicing Kit was created in partnership with Syncronos Design Inc. If you are interested in green building, we highly recommend picking up a copy of their DVD entitled Building With Awareness. This award-winning, beautiful and informative program was designed and produced by our creative partner Ted Owens. In addition to iPhone apps, You-Betcha Interactive also provides board game inventions to the toy industry. Some recent licenses include Disney Princess Friends Forever, Laundry Jumble (featured in the November 2010 issue of Parents Magazine, and the holiday issue of Good Housekeeping), the award-winning Sumo Ham Slam and the Flip-a-Longs series. The complete list of published games can be seen here. We're excited to say there's more in the works! Please support our publishers, and pick up one or more of these delightful games.